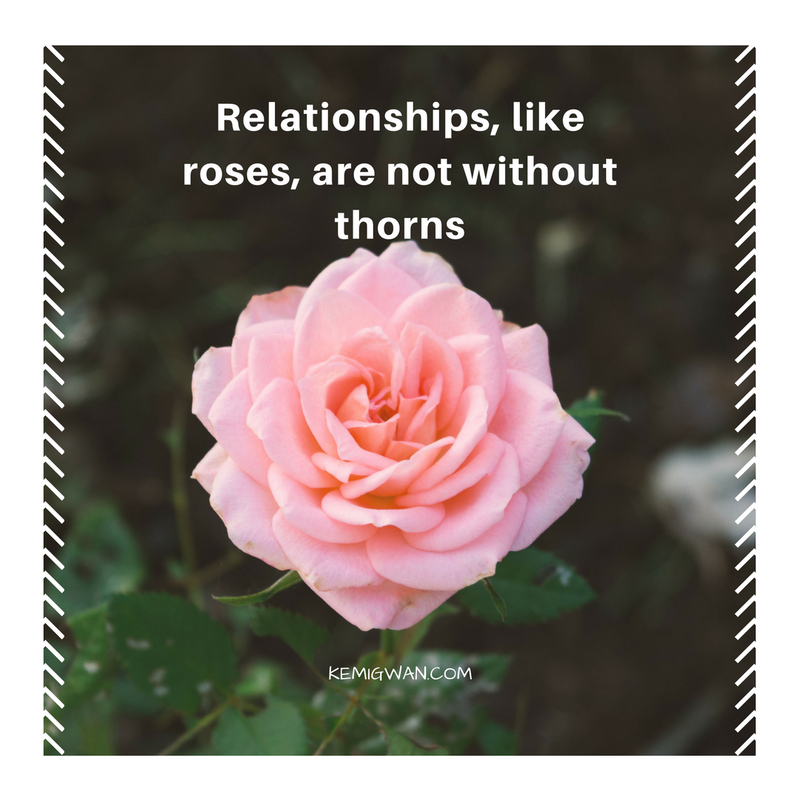 Moments With Kemi Gwan: RELATIONSHIPS LIKE ROSES. Life, like a rose is incomplete without nuances that are often as prickly as thorns. There is no relationship in life without problems and challenges here and there. Relationships ought to exist beyond what we can benefit from others. A relationship should be about the other person and less about you. If we treated relationships with this law in mind, wouldn’t you agree that the world would be a better place? So, what do I hope to achieve with these words today? I hope this article stirs you up to work hard at preserving the good relationships in your world. I hope it makes you think of someone who has been good to you and you reach out to them and make an effort to improve, repair or restore your relationship. I hope you think about getting to know your neighbors and genuinely start caring about them and showing them you care. Recently, I had to pull my grown girl pants up to have a chit chat with myself about how I treat my relationships. Sometimes I’m great and then I fall off and I lose really great friendships. Mostly, because I find it hard to keep up or I am consumed with my own life and literally have no time to create space for others. Reality check! This is the same for most millennials- between work, children and marriage and old friends, we just end up preferring our safe haven of independence and individualism. Of course, this way of thinking, is sometimes inherited from our parents or adopted from our peers. However, no real happiness comes from isolation. Isolation, instead, often leads to depression. The more you lose faith in genuine human relations, the more isolated and depressed you become! I for Isolation = D for Depression. I believe strongly that positive relationships that are built on a desire to be of value to others can reduce the risk of depression. We live in great homes in America but refuse to meet our neighbors. I mean it beats me. Though my parents were very protective of us, we still enjoyed the joys of relationships with great neighbors while growing up in Nigeria. Parents could leave their children with their next door neighbors without hesitation or a second thought. I have heard older folks in America attest to this style of living years ago. Mothers would be less grumpy and parents would be happier. Just knowing someone is there sometimes. My opinion..
You might be asking; what do I need to change to have and keep better relationships? Learn people’s love languages and give them love their way, not your way. Seek for only the best in people. In any given relationship you are only expected to love and give love. Give whatever you would want for yourself. It’s the law of nature to receive what you give, maybe not from the same route. If you want kindness, give kindness! If you want love, give more love. Have you heard the saying, “no one is an island”? I strongly believe that you need the right relationships to achieve success in life. It’s impossible to be great without mastering the art of relationships. At the same time, some of the richest and most successful people are often the loneliest. Gifted people end up ignoring the most important gift- the gift of humans, as they bury themselves in their talents or money. No wonder suicide seem like the next and only option. You might ask again, how can I manage relationships and success? Truth is; it is hard just like anything else. Marriage even becomes tougher as you have children. 😜😊. So, you see, it requires a little more effort than your usual.